This new jute gift bags concept has gained immense popularity over the past few years. Eco friendly and affordable in nature, these Jute Bags are time saver as there is no need to wrap your gifts with gift papers or other decorative items. Moreover, later on these can also be used for other purposes like grocery and shopping as well as for other day to day uses. 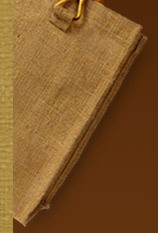 Apart from being available in different colors, Gift Jute Bags come with unique patterns. These are made in various types to suit various occasions such as birthdays, weddings, house warming, baby showers, etc. There is unique design of these bags in the market from where one can select the ideal gift bag, as per his / her liking. The Jute Made Gift Bags look classy and very elegant in comparison to paper, polythene, and other material bags. Also, these eco friendly jute gift bags are high on strength, longevity and offer full value for money. Easy to carry and having unmatched aesthetic appeal, Jute Gift Bags have become the preferred choice of people of all ages. 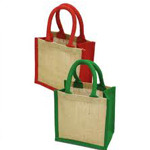 Hence, to appease their demands various companies are selling jute bags for gifting purposes online. You can own one or more jute gift bags, with just a click of mouse.